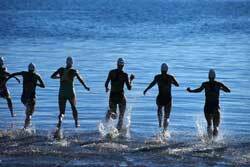 The list of Open Water/Long Distance All Americans for 2013 has been published. To achieve this honor, a swimmer must win an OW/LD national championship. Four women in our LMSC earned this distinction: Amy Charley, Pam Dameron, Shirley Loftus-Charley, and Kate Stephensen. Congratulations, ladies! Their winning swims are listed in the table below. Shirley and Amy were also Long Distance All-Stars for 2013. All-Stars are decided based on a point system, only one swimmer can be selected for each gender/age-group. So they are truly the crème de la crème! Shirley’s point total exceeds those of all the other All-Stars by a pretty large margin, so it isn’t much of a stretch to suggest that she is perhaps the premiere long distance swimmer in USMS national championship series. Well done, Shirley!